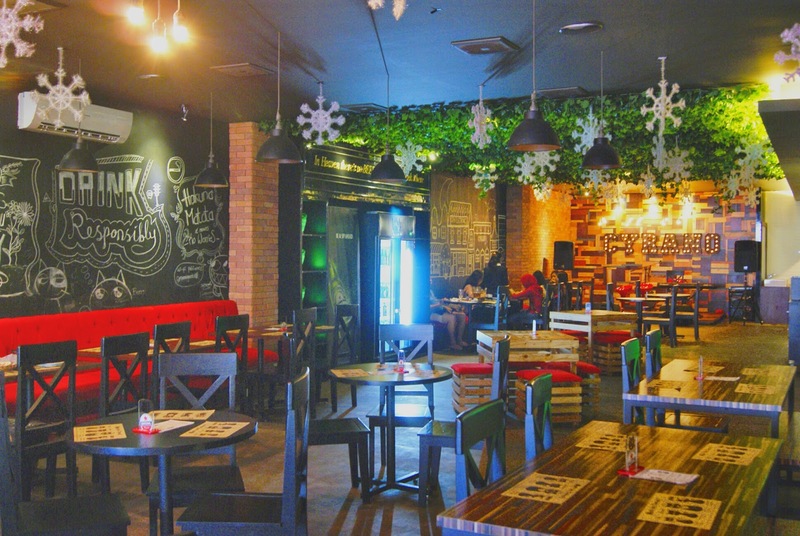 F&B Business in Bogor has grown rapidly for the past 2 years, a new cafe opens every months in different location in Bogor's major culinary districts like Padjajaran, Bantarjati, Villa Duta, Suryakencana, Pandu Raya, Sudirman/ Air Mancur and many others. 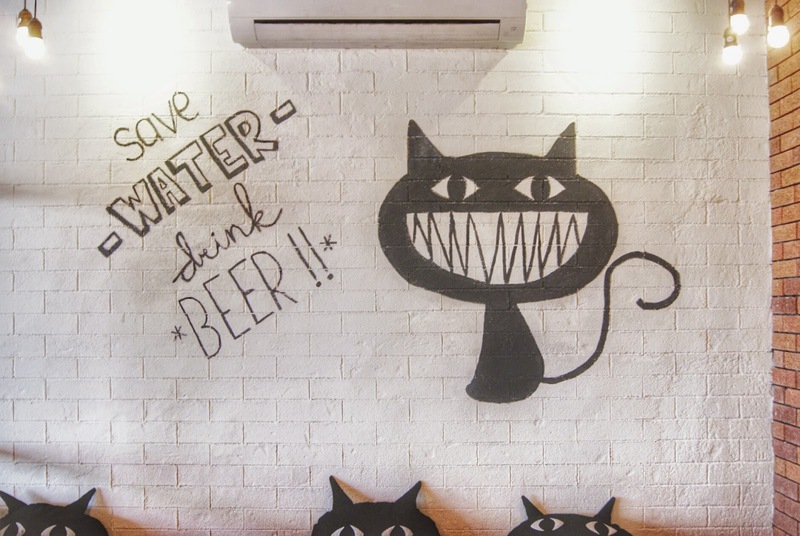 Today im gonna review the newest and hippest cool cafe in Suryakencana, theyre already opened for 3 months and here it is, please welcome Cyrano Cafe. 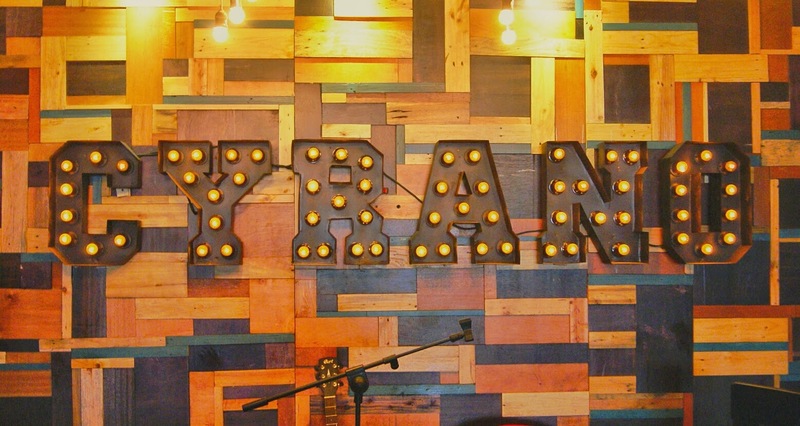 Opened it store on November 2014, Cyrano brings Suryakencana culinary culture to a new level, since Surken "simplified name of Suryakencana" is well known for it culinary epicentrum and the heaven of hawker or street food seekers and also the Chinatown of Bogor. 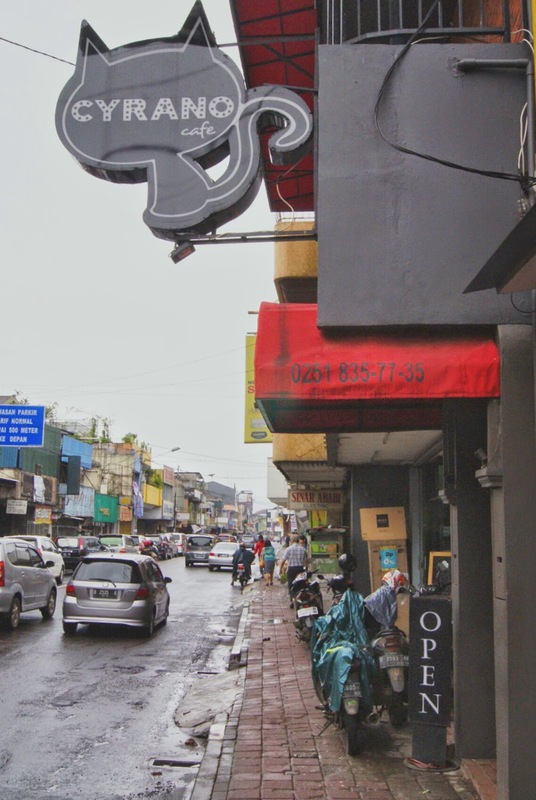 Cyrano cafe is located in Suryakencana street near by the Pasar Bogor (Bogor traditional market) and if you know the famous "Ngesti" grocery store, Cyrano was right after Ngesti so you know where to stop by. I've been stalking and wondering pretty much about Cyrano and how it would be even months before they're open for public. I always passed Cyrano whenever i heading to home from Bogor Train Station to Sukasari via Suryakencana but i dont know why i always have no time even i frequently passed this cafe until my visit to Cyrano today. At first i wonder that Cyrano will appears with kind of Gipsy looks or even Mythical looks because the black cat is identical with mysterious thing, but hey ! They're prove it wrong, Cyrano comes with more Carnavalish looks with dim and a bit romantic ambiance. Okay, just enough for the intermezzo. I thought you guys just cant wait to skip directly to the main topic. Today, February 9th 2015 i make a visit to Cyrano Cafe with some of my friends from High School, even it was a heavy rainy day all day long we just decided to go through here at 1.30 pm. 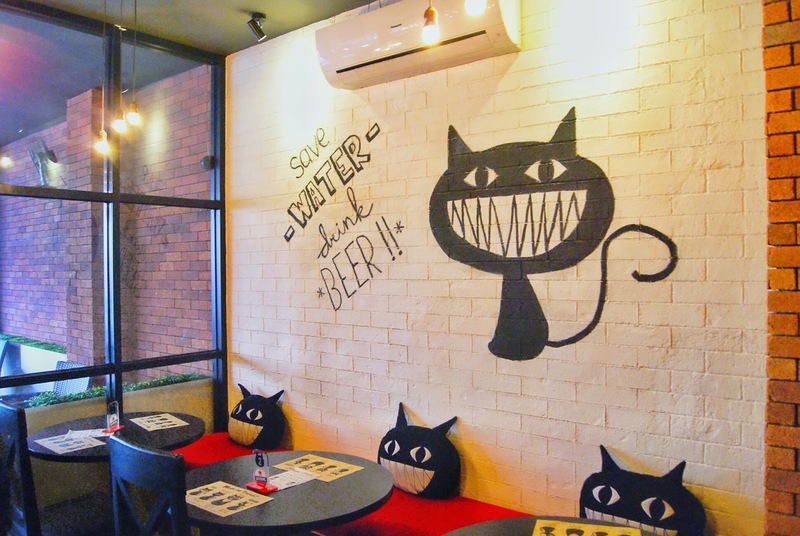 When you first arrive, you will see an open door with classic maroon canopy and black round-shaped neon box with Cyrano black cat logo up there. Cyrano is occupy the 2nd floor of the building so you have to go through the stairway from the front door. 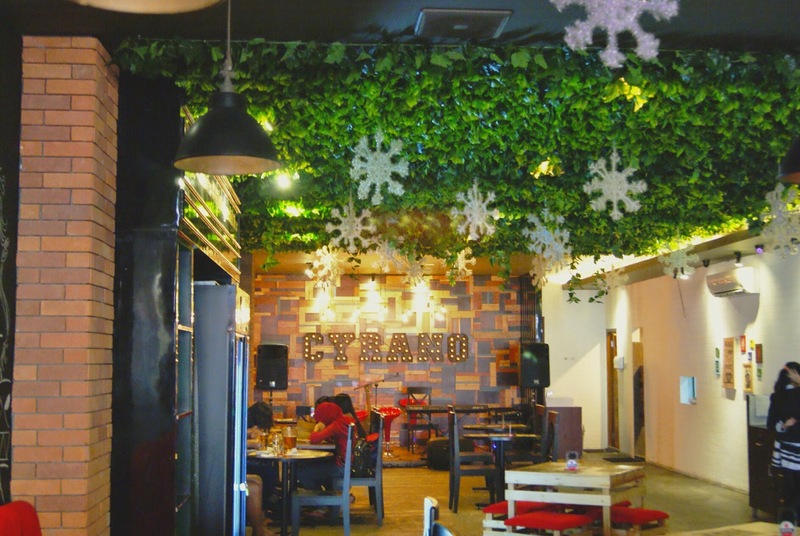 First note, you'll not notice that Cyrano interior is that spacious because it tiny entrance, but after you get into the 2nd floor you'll surprise by how spacious is Cyrano actually. 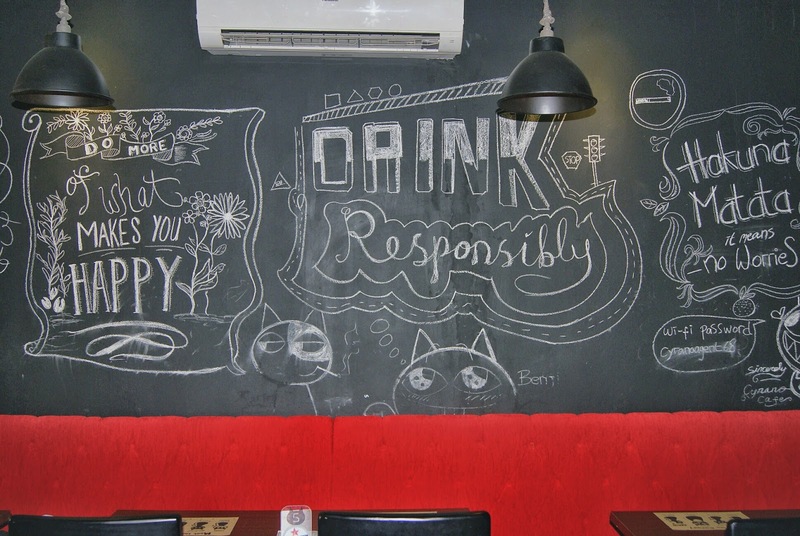 Cyrano's interior is dominated by black tone with some mural painting, chalk hand-drawned character,hanging lamp and some ornaments as the decor. 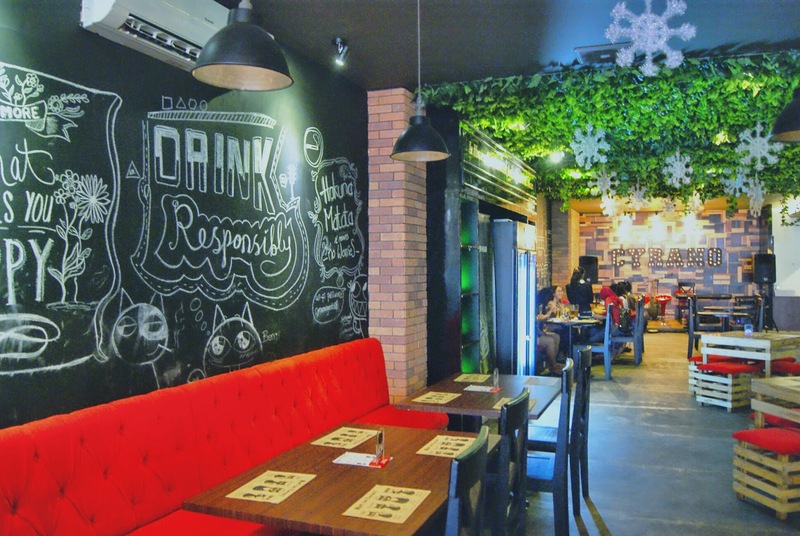 The ambiance is slightly romantic and relaxing, it supported by dim lighting and accoustic music selection as the background like if you know some of the famous youtubers jayesslee, boyce avenue, madilyn bailey, that kind of music. That's all about the design and interior, now is time for foods, which is your favorite part of all. 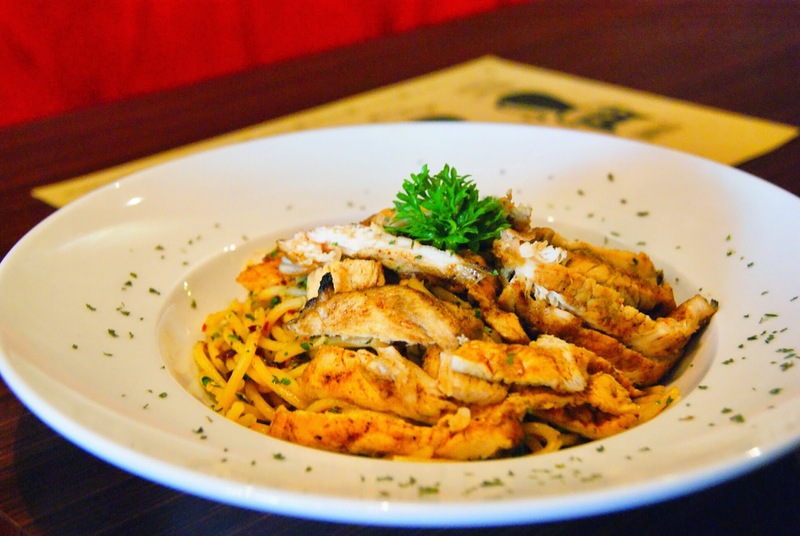 Cyrano's food is dominated by Western influence cuisine and might be some fusion as their signature. With wide range of food selection from salads, soups, pastas, steaks/grilled, desserts, light snacks, mocktails, beers, and coffees and smoothies as well. The highlight and maybe bring your curiousity and make you imagine how does it tastes is their fusion breakfast dish, Rendang Omelette. 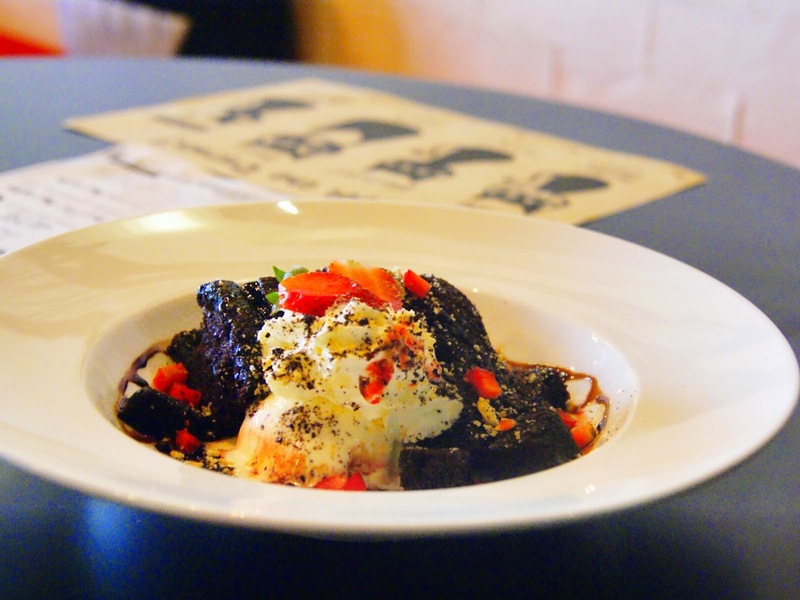 I've searched through social media and the Rendang Omelette is mostly having positive response from the customers. But i didn't try it today, maybe on my next visit i'll probably have it. 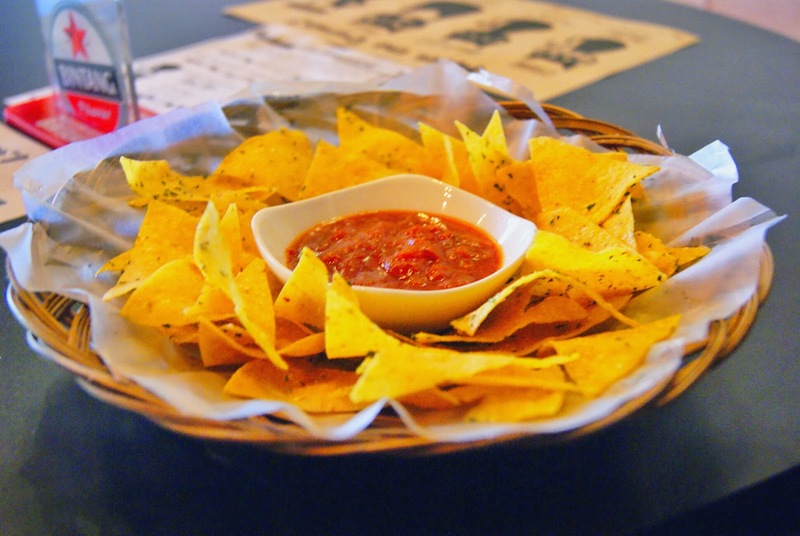 A classic tortilla corn chips served with soury-refreshing marinara sauce. The tortilla was thin and crispy while the marinara sauce has the sourness and sweet taste that compliment the whole dish in a good way. My friend said that the marinara sauce is quite addictive so she can't stop munching it all the time. I must say that this version of aglio olio is one of the best aglio olio pasta i've had so far. This is also classified as chef recommendation here in Cyrano. 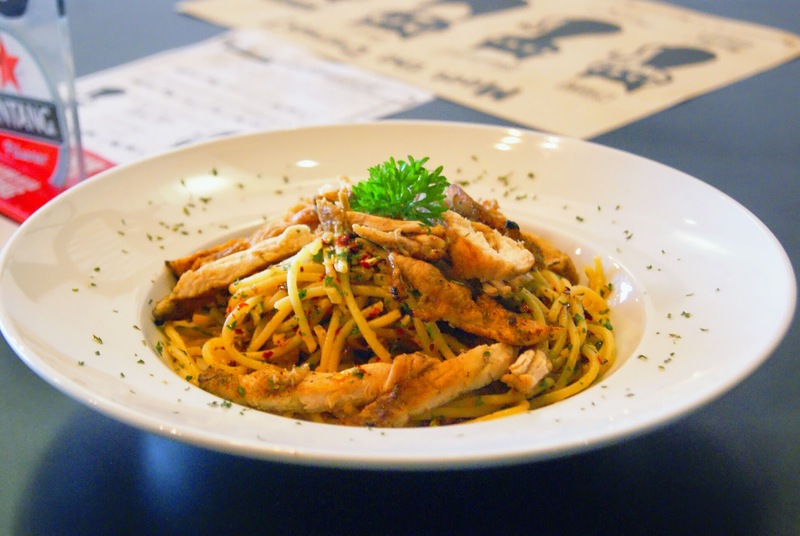 As you already know that aglio olio means garlic for aglio, and olive oil for olio, seasoned with some chopped dried chilli and parsley and they're prefer using grilled chicken for the topping. To be honest, i fall in love with the grilled chicken, the seasoning play the main roles for my taste-bud, the chicken itself was juicy, tender, and has that smoky flavor. Just to let you know, i find that it's quite spicy and strong at the same time, but still acceptable for spicy food eaters like meh. Overall the dish was good and the grilled chicken was da bomb. 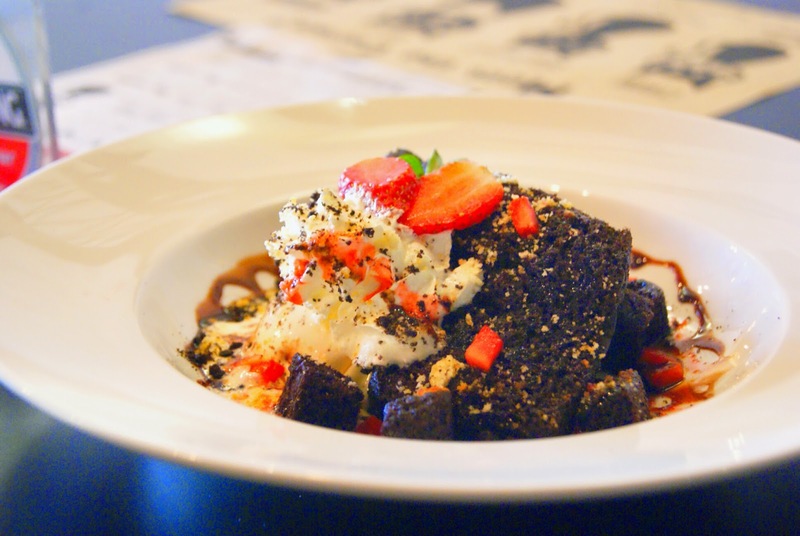 Love this one, the brownies is really soft and fluffy yet firm at the same time, served with vanilla ice cream and biscuit crunch for a crumbly texture. If you mix all the component in one bite, youll have a nice texture play in your mouth. Youll have that soft, moist, creamy and crumbly texture, overall this is good. 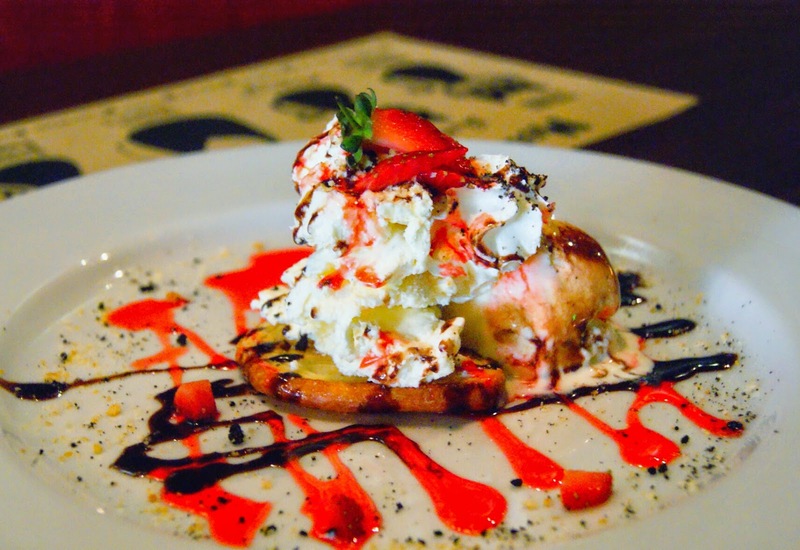 Cyramissu is actually the deconstruced version of tiramisu by cyrano, the combination consist of palmier pastry form to replace the lady finger and sponge cake as the base and topped with whipped chantilly cream and mascarpone cheese. 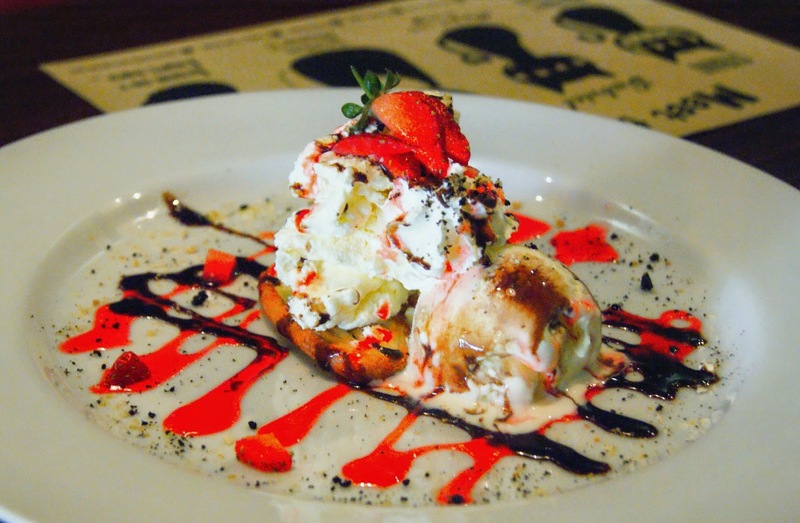 I was curious at first when i stalking about the Cyrano and found that they serves different intrepretation of tiramisu by creating their own cyramissu, and i'm going to fulfill my curiousity of this one. The cyramissu was good, i love how the combination of palmier with chantilly mascarpone cheese, i can find a hint of lovely coffeeish flavor from the cream, the palmier give a nice flaky texture to it, and the chocolate and strawberry sauce is completing the whole dish. I'm gonna have this when i'm back here. 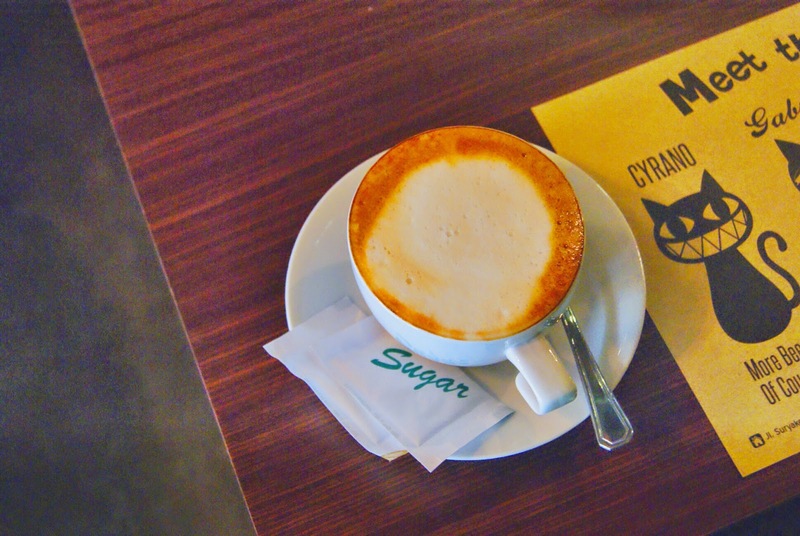 Since it was a rainy day when i visited Cyrano, i prefer of having a cup of hot cappuccino. Flavor-wise, it was like any regular cappuccino i've tasted in any cafe, and it was okay. but since coffee is not their main focus so it's still quite good tho with a balanced mix of latte and coffee with acceptable acidity level. Overall my first visit to Cyrano is really good, start from the venue-wise which i found quite unique because it's located in a bustling chinatown area but Cyrano really step up and prove that upscale service can also compete with the multicultural neighborhood and make Cyrano's becomes one of the hippest venue around Suryakencana itself, despite of the limited parking space with crowded line along Suryakencana street, it's still quite good for me since i am more to "angkot" person so i can easily stop by everywhere. But i hope that Cyrano still can manage and attentive enough with this particular concern of the parking space issues to gain more visitors and loyal customers even more in the future. 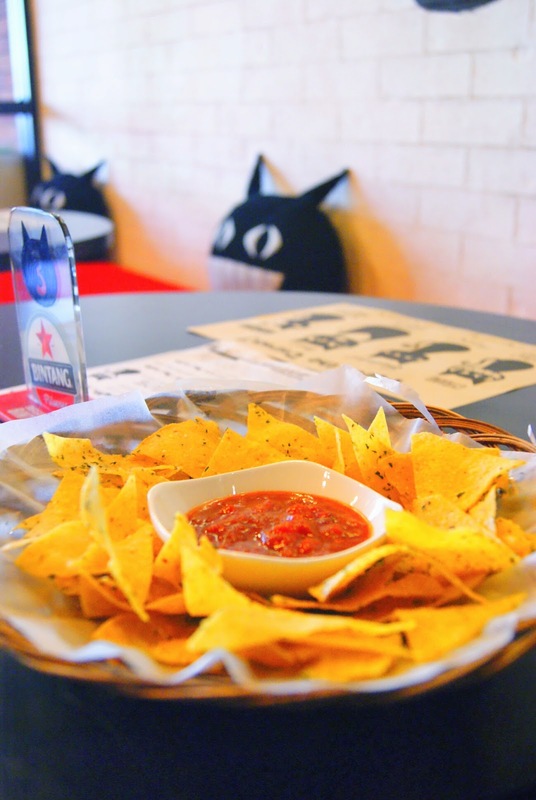 And then about the food, so far i have nothing to complain about, they're serves wide selection of western comfort foods in a good way with affordable prices, comparing the price with the taste, serving portion, and the quality it's really worth to try. I think Cyrano can be a strong contenders among the others if only they could maintain the standarization for food and make an improve periodically with some creativity, it can be their key to success. And the last about the service, the service is good and relatively fast from the order to kitchen and from kitchen to table is still in a good direction, but however theyre need to be more attentive and keep up with the standard, thats how F&B industry should be. 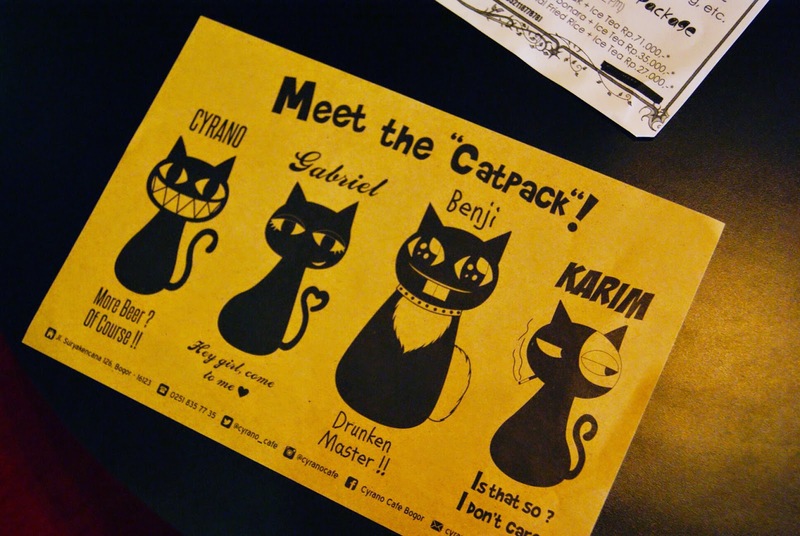 Okay and that was da bomb of the day, i must say that im having a really good time at Cyrano, all packs in a good packages and im looking for more goodness from you. 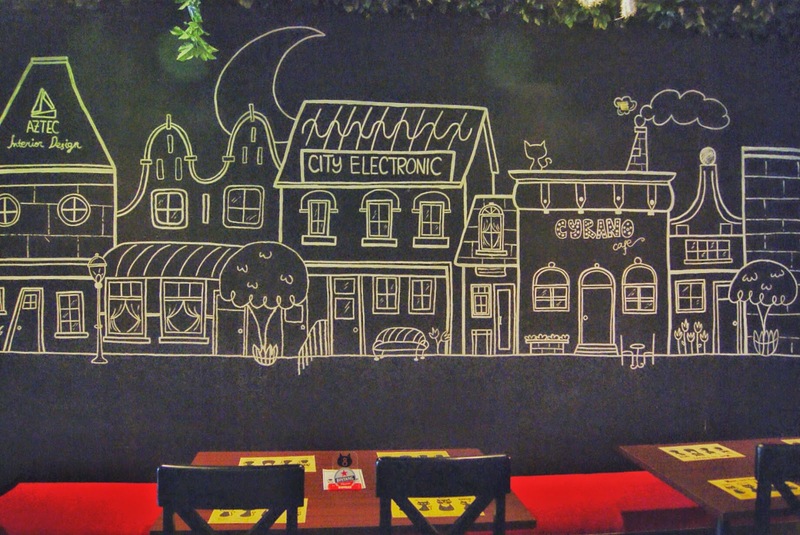 I wish that Cyrano can survive and show up in Bogor's vibrant F&B businesses until then, can't wait to have more of you very soon.